The Octoplus development team produces customised web-based database systems. Our team includes experienced developers, database designers and information and usability specialists. We develop systems that are structured and logical in use and presentation. We are focused to create systems that successfully combine sophisticated functionality with simplicity. We have extensive experience in the LAMP (Linux, Apache, MySQL and PHP) development environment. Although we do not normally prefer to develop in environments other than LAMP, we have thorough knowledge of ASP, Java, C++, Delphi, Visual Basic etc. Most of our systems are database driven and based on MySQL (Open Source). We also have experience with Oracle and MS SQLserver. We build powerful systems that are easy to use, manage and maintain. We provide our clients with the tools they require for such tasks as managing web content, administering contact bases and interacting with existing systems. Each information system we design is custom-built to provide the functionality our clients require. 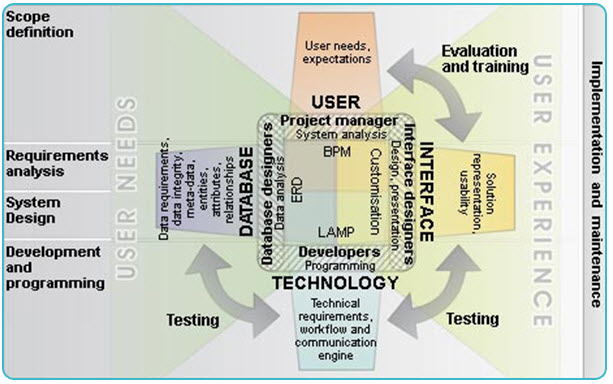 Octoplus specialises in the development of applications that support Business Process Management (BPM). We developed a workflow engine specifically for this purpose. The workflow engine is already successfully implemented at a number of our clients.